Start your day off with a good breakfast. 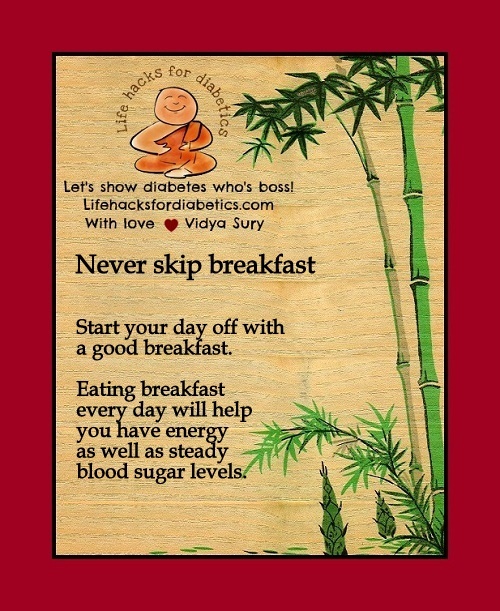 Eating breakfast every day will help you have energy as well as steady blood sugar levels. This is very true! Your metabolism rate slows down when you skip breakfast. As a result, your sugar level drops too which leads you to be less energetic. Oftentimes you will notice that you cannot concentrate on your work because you have an empty stomach and less energy to start your day. Oh dear. I’m not a good breakfast eater, even though I know it is important. I just forget. I’ll have to make more of an effort to make the time. Nicola! Please, please do start the habit! I used to be like that too – and now that I know better, I feel foolish. Didya know breakfast helps you lose weight? Make sure you get protein into it! Hugs!